The purpose of economic development in any region is to provide opportunities for improved living and jobs to people. While industrial development invariably creates more jobs in any region, possibilities of adverse effects on the environment also increase, if adverse effects are not reduced. Industrialisation has led to environmental degradation in terms of industrial pollution. With industries operating, a 100 per cent pollution-free environment is a myth. It is neither possible nor necessary. However, it is imperative to ensure that industrial units cause the least pollution. Adequate and effective pollution control measures are required so that adverse effects on the environment are minimised. Necessary technological know-how and institutional back up support are available in this regard. Dust, smoke, fumes and toxic gas emissions occur as a result of highly-polluting industries such as thermal power plants, coal mines, cement, sponge iron, steel & ferroalloys, petroleum and chemicals. In industry-specific clusters, these have not only become hazardous, but also cause irreparable damage to our ecology and environment, often breaching the environment’s carrying capacity. High emission level of pollutants at industrial clusters has been reported in Raipur-Durg, Korba-Bilaspur, Vapi-Ankleswar, Dhanbad-Bokaro, Vizag, Tarapur and Ludhiana. This is despite the fact that the number of power plants switched over to super-critical technology. Steel, cement, chemicals and petroleum refineries have adopted state-of-the–art technologies. There is an urgent need to review and rework the strategies of setting up industry-specific clusters based on comparative advantage. The National Green Tribunal recently pulled up implementing agencies for allowing untreated sewage into the Ganga through 30 drains along the river’s Haridwar-Unnao stretch and ordered a CBI inquiry. Discharge of untreated industrial effluents from industries such as tanneries, power plants, textiles, jute units and chemicals along the entire stretch of the river from Kanpur to Kolkata is one of the major causes of polluting the Ganga, despite the centrally-funded Namami Gange project. Incidentally, the Ganga Action Plan (GAP) phase 1 started in 1985. Discharge of effluents from industries located in Haryana (Yamuna Nagar, Ambala) has been polluting the Yamuna since long. Instances of Damodar pollution in eastern India have also been reported. The Supreme Court had earlier come down heavily on the implementing agencies and closed down tanneries (Tamil Nadu) and iron ore mining in Goa for flouting environmental laws and causing damage. This reflects weakness on part of law enforcement agencies, lack of coordination among regulatory agencies (Centre and states) and the absence of commitment and efficacy of the agencies and industries. Mere legislation on pollution control would not serve any purpose. Compliance of anti-pollution laws has to be strictly enforced by the state agencies. Accumulation of industrial waste has assumed great proportions while its utilisation has been neglected for long. When conservation of environment is of prime importance, a lot of weightage should be given to recycling and reusing discarded components. Scientists have been researching worldwide towards the development of innovative recycling techniques. Products made out of recycling such as fly ash cement, fly ash bricks, recycled aluminium, recycled tiles, recycled steel, environment-friendly paints and bamboo-based products are available in India. India recycles 90 per cent of its Poly Ethylene Terephthalate (PET) annually whereas the recycling rate for PET in Japan is 72.1 per cent, 48.3 per cent in Europe and 31 per cent in USA (CSIR-NCL study, Hindustan Times February 27, 2017). However, recycling of plastic waste is far from satisfactory in India. Commercial utilisation of fly ash, blast furnace slag, cathode/anode carbon scraps, red mud, iron ore and blue dust fines are in progress. Recycling of residual waste obtained after incineration of toxic and highly inflammable chemical waste with cement clinker is being undertaken in the cement industry. A huge market still remains untapped (metals, mobile phones, computer hardware equipment). Recovery of e-waste is abysmally low and we need to encourage recycling of e-waste on a very large scale so that problem of e-waste disposal is tackled. 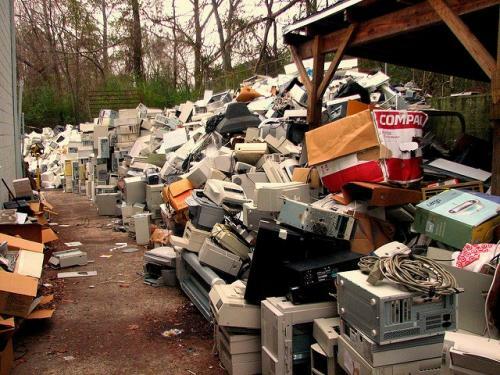 It is reported that e-waste concentration in the Indian soil is twice the global average. Delhi alone generates 15,000 tonnes per year in addition to the e-waste imported for recycling. High levels of tetra and penta PCB congeners were observed in soil samples from East Delhi (Hindustan Times, February 19, 2017). It is, therefore, important to step up commercial utilisation of industrial waste which can be accomplished by involving industries, users, states and central government departments. Industries have to be made responsible regarding recycling on a regular basis through strict enforcement. we are looking for e-waste management courses in india. or any workshops from your side.